Originally posted: December 1, 2018 . Last modified: December 10, 2018 . 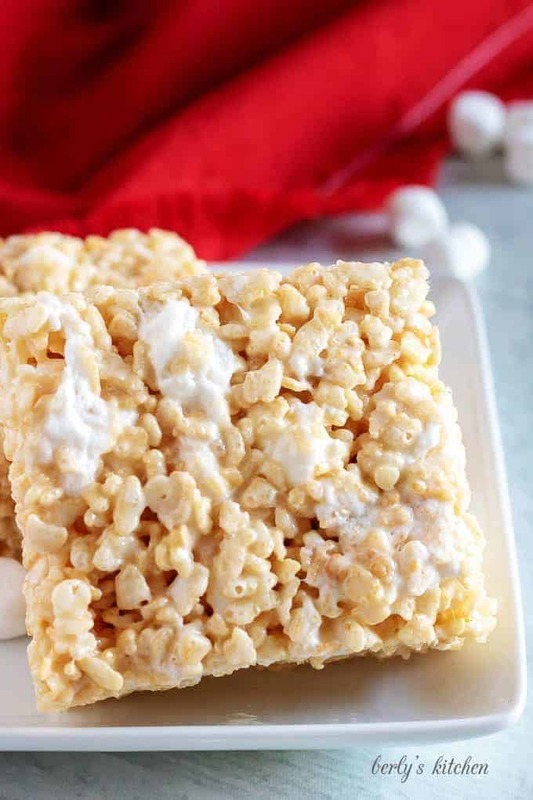 The Perfect Rice Krispie Treat Recipe starts with butter, lots and lots of marshmallows, tons of crispy rice cereal, a hint of vanilla, and did I mention marshmallows? The results? 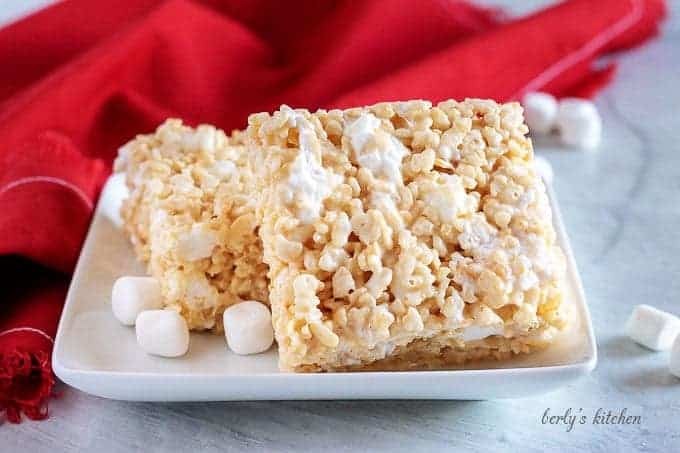 Rice krispie treats that are perfectly soft, ooey, gooey, and filled with all the goodness of the original recipe, only amped up a bit. To say I’m a tad bit excited to share this rice krispie treat recipe with you is an understatement, but I’m also a little hesitant. It almost seems too easy. According to some internet searching, the first rice krispie treat recipe came out in 1939, so this definitely isn’t a new or original idea. However, I never followed the instructions on the cereal box. I’ve been making these marshmallow treats since high school and always changed up the recipe a bit. Extra marshmallows are a must, as well as, a touch of vanilla. The problem was, I never wrote down the exact amounts of the ingredients, so my recipe wasn’t consistent, until now. I’ve finally nailed down the exact amounts of each ingredient for the perfect rice krispie treat recipe! They make great gifts or treats for school parties. 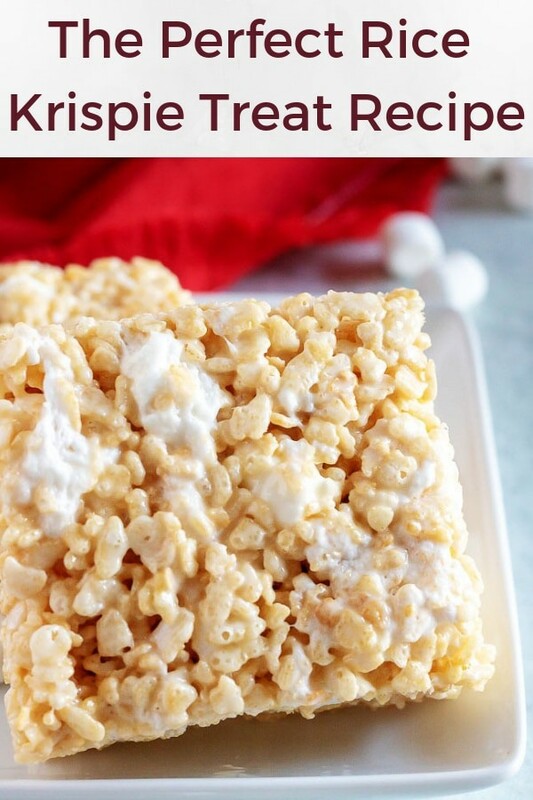 These rice krispie treats are also a wonderful recipe to make with kids. Some of our other family friendly, holiday recipes are soft sugar cookies, rocky road fudge, and peppermint bark, but these are my absolute favorite, especially around Christmastime. There are only four rice krispie treats ingredients. Crisped rice cereal, mini marshmallows, butter, and vanilla. This recipe makes a big batch with bakery-style treats. It also comes together quickly, so have the ingredients measured out ahead of time. Line a 9 x 13-inch baking dish with non-stick aluminum foil or spray the foil with cooking spray. Make sure the dish is at least 2 inches deep. The treats come right up to the top and completely fill the dish, so anything less than 2 inches won’t have enough space. Place the butter and 15 cups of marshmallows into a large pan and melt over low heat. Stir constantly, so the marshmallows don’t stick and burn. After the marshmallows are completely melted, remove from heat and add the vanilla. Immediately stir in all the cereal. The mixture will begin to cool quickly, so make sure to combine all the cereal before it sets. This is the best part! Once the cereal and marshmallows are mixed, add in the additional miniature marshmallows. The mixture won’t be warm enough to melt the marshmallows, but it will soft the edges. 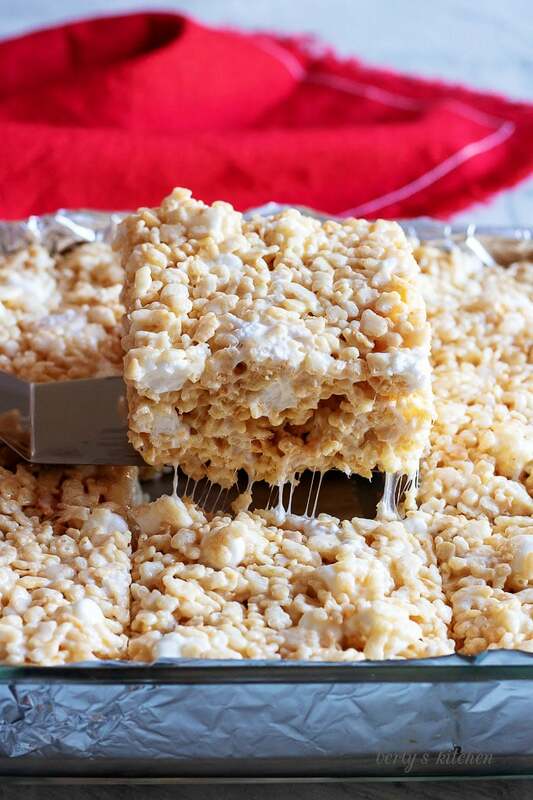 Scoop out the warm rice krispie treats into the prepared pan. Spray your hands or a spatula with cooking spray, and press the treats into place. Allow them to set for about 30 minutes to an hour before cutting. How to keep rice krispie treats fresh longer? Store the treats in an air tight container. Do not store the treats in the refrigerator. The cool air tends to dry out the cereal leaving the marshmallow treats dry and hard. Wrap the individual rice krispie treats in plastic wrap. How to use marshmallow fluff instead of mini marshmallows? Simply substitute the miniature marshmallows with 4 (7.5 ounce) containers of marshmallow creme. Add it to the butter, and melt over low heat. The mini marshmallows can still be added at the end or omitted. It’s up to you. 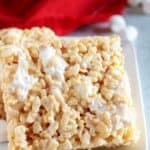 How to make rice krispie treats in the microwave? 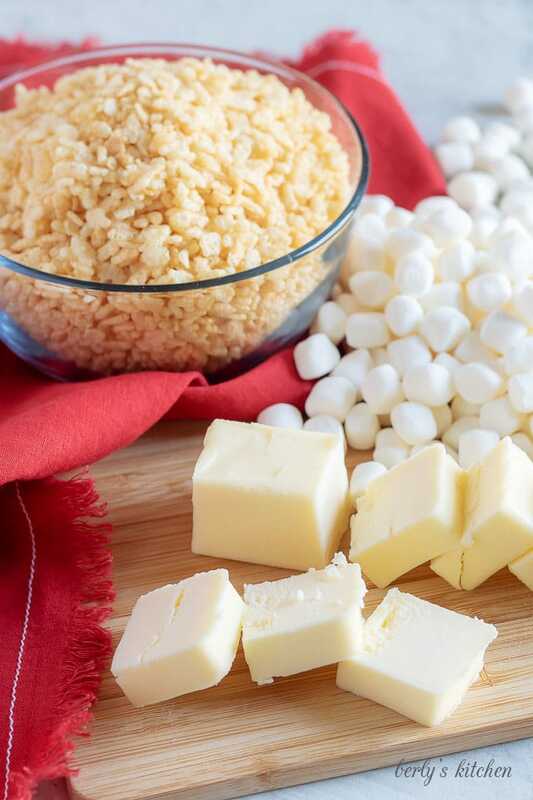 In a large microwave-safe bowl, heat the butter and marshmallows while stirring every 20 seconds. After the marshmallows are melted, add the vanilla and cereal. Stir in the cereal until completely combined. Add the remaining mini marshmallows, then transfer to the prepared baking dish. What else can I put in marshmallow treats? The possibilities are endless. Here are some ideas! We’re partial to these Rice Cris-Peeps! 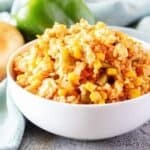 If you like this rice krispie treats recipe, please leave us a comment and rate the recipe card. You can also find us on Facebook, Pinterest, Twitter and Instagram searching for Berly’s Kitchen! Line a 9 x 13-inch baking dish with aluminum foil, then spray the foil with cooking spray. 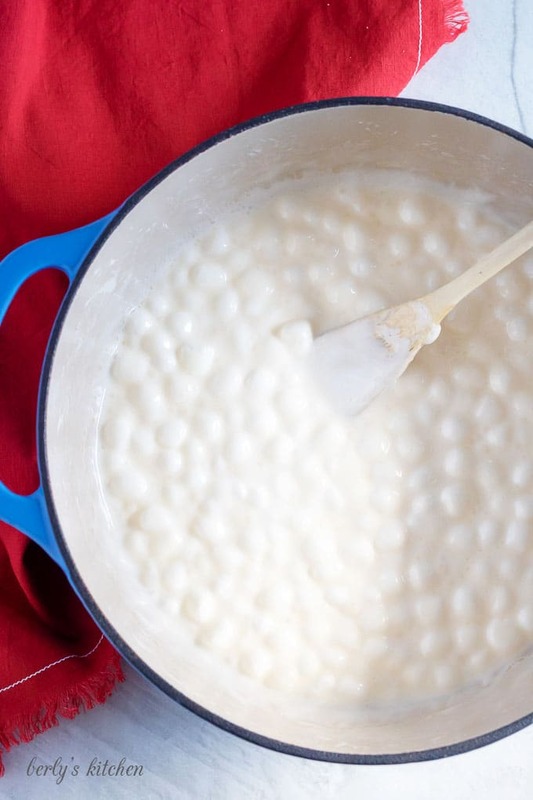 In a large pan, melt together the butter and 15 cups of marshmallows over low heat while stirring constantly. After the marshmallows are completely melted, add the vanilla. Next, stir in the cereal. When the cereal is combined, mix in the remaining 5 cups of miniature marshmallows. 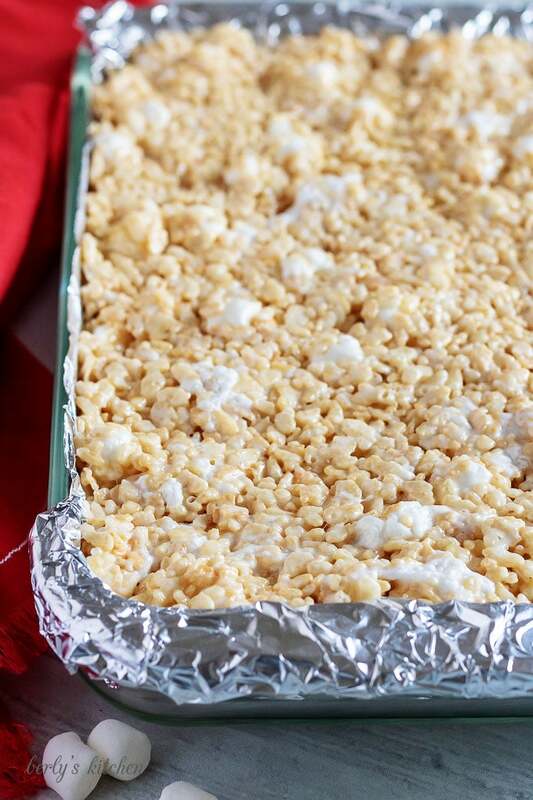 Scoop out the warm rice krispie treats, and transfer to the prepared baking dish. Spray your hands or a spatula with cooking spray, and press the mixture into the dish to form an even layer. Allow the treats to set for at least 30 minutes before cutting. Cut into 12 large squares, and save any extras in an airtight container for up to 3 days. *The calories listed are an approximate and based on the serving size and ingredients listed. *Please see post for alternate cooking methods, ingredients, and storage information.